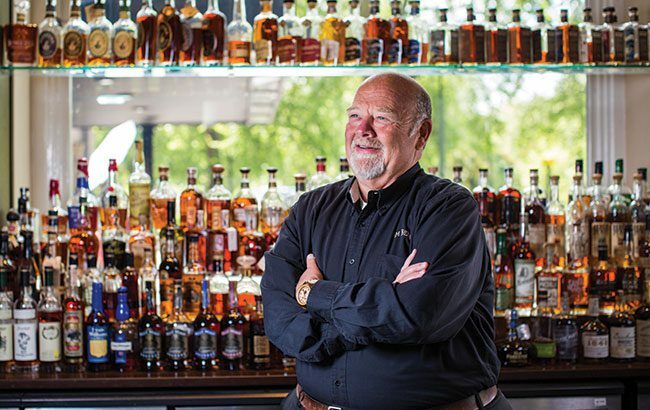 Jim Beam’s great-grandson and master distiller at Jim Beam Bourbon discusses the importance of family and community to Kentucky’s thriving Bourbon industry. What separates Jim Beam from other distilleries? Our family has been doing this since 1795. The thing that separates us from other whiskeys and distilleries is there’s been the family name making the product since the beginning. Of the company, it means we have got legacy, history, tradition and owning quality right down to the ingredients we put into our products. What is Jim Beam’s main ethos? Our business is based on relationships, with each other and with our customers – we’re one big family. My son, Freddie, is eighth-generation and has been working with us for six years. It’s got me excited working with my son – he’s like a sponge; he absorbs everything. He’s got a daughter so who knows, we could have a female distiller at Beam. Working on my father’s Booker’s Bourbon excites me the most. That was his legacy, so sharing it has been very proud moment for me. It’s something he asked me to do before he passed away, to “take care of my Booker’s Bourbon”. That’s what gives me most pleasure, working on Booker’s Bourbon’s growth because it was dad’s baby. But also watching my son come into the business is very rewarding for me. Every parent is proud of their children but when they follow in your footsteps, it’s kind of cool. Trying to keep up with demand. The products we create today are sold at least four years from now. So we’re constantly looking at trends that might be happening four­-plus years ahead; that’s tough. One thing about forecasts is they will never be exact – you just have to manage it as best you can. What is the whiskey community like in Kentucky? Bourbon is a unique industry; we are all legitimately friends and enjoy each other’s company. You never hear negative protests within Bourbon; we never speak down on each other’s work. In the end we are all making Bourbon and we all love what we do. If one of our buddies has a problem, we will step up and help them. What is your most memorable whiskey experience? We did a collaboration for Parker Beam [Heaven Hill’s late master distiller emeritus]. All the distilleries, we all came together, brought Bourbon and made a Unity bottle [Master Distillers’ Unity], which was sold at auction, and we gave all the proceeds to the ALS [amyotrophic lateral sclerosis] Association. It was a really proud and sad moment for all of us. For Parker, he knew there was no cure for his debilitating disease. Doing something for him before he passed away with every distillery in Kentucky was very cool, but it was also a really sad moment for all of us. Are there any other collaborations you would like to do? I’d love to work with other whisky producers from around the world, or wineries or breweries. The only way we can grow as a Bourbon brand and as a category is by sharing ideas and inspiring each other. How do you drink Jim Beam? I pretty much stick to Jim Beam and a little ice or water. But I love a Whiskey Sour if it’s made with fresh ingredients, and I do enjoy a Manhattan. It’s amazing how old cocktails are coming back – and they are really good. Do you see Jim Beam as a craft brand? Absolutely. Anybody who makes whiskey, no matter what volume, it’s a craft. You still have to do something: grow the grain, cook the grain, distil, mash, select the barrel, reduce the strength after ageing – all of those things, there’s craftsmanship in all of it. Jacob Beam [Jim Beam founder] was a craft distiller when he started – we’re just lucky my family still does it.